Your favorite giveaway type… the code dump! First ones here get the codes. I live in CA and got these from GameStop, so these are NA codes. 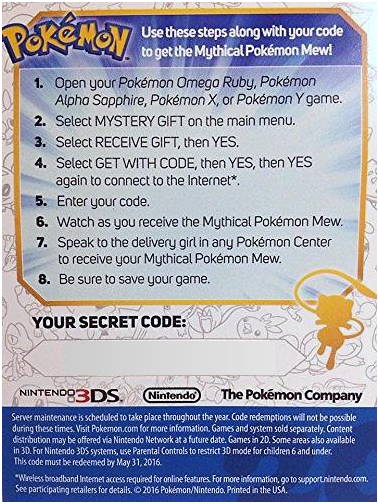 You can only redeem 1 Mew code per Pokemon game (Pokemon X, Y, Omega, or Alpha only). I am lucky enough to be around several GameStops, and I visited a few to get codes for myself and for friends! Here are some extras, enjoy! Comment with the # you redeemed, so people know when they are all used. The even runs until February 24th, but codes do not expire until May 31st, 2016. The February 24th date just means they will not be distributing more codes after that date. Pokemon is giving away tons of Legendary Pokemon for their 20th Anniversary, and I’ll grab any that come to GameStops near me! This means I will have Darkrai codes in May, Arceus codes in August, and Genesect codes in November!